I started canicrossing 4 years ago after watching the Canix race while I was down at Crufts showing Jura. When my first dogs got to old for agility or even for going for a decent long walk I had started road running to keep myself fit and busy. Now with 2 young dogs again I was keen to get back into agility but was also enjoying my running so this new dog sport seemed ideal, exercise human and dog and have events to go to together to meet like minded people and their dogs. After watching the Crufts race with my son Fraser we went off to a stall at the show and bought 2 Fleece Harnesses and a rough gear bungy line. These bits of kit were ok to get started and I still use the fleece harness on Jura as she doesn’t pull much but I soon was at a Canix race at Keilder (May 2009) and seeing everyone running their dogs in x backs I asked about them and was told yes that was what I needed. I bought them from Culpeppers (http://www.culpeppers.co.uk/) Although I’m still using those xbacks if I was buying new harnesses I would likely get something like the euro harness (http://www.innerwolf.co.uk/euro-harness.html ) or (https://www.canix.co.uk/shop/index.php?_a=viewProd&productId=379) as it looks much more comfortable for the dog. There are lots of opinions and discussion on the best harness for each dog sport discipline but they are like running shoes and what suits one dog might not suit another, ask about and shop about there is a huge range don’t do what I did and rush off and buy something that you want to replace once you know more about what you are doing. My first waistbelt was a proper canicross on bought form Snow Paws website (http://www.snowpawstore.com/) but quite heavy and had big attachments so I sold it and bought myself a new lightweight Eura Waistbelt (https://www.canix.co.uk/shop/index.php?_a=viewProd&productId=473) which I love, hardly feel like you are wearing anything so comfortable. After the Keilder race we were completly hooked, Fraser was 2nd in Junior male with Tiree and I had loved every minute of the trail course, discovering that trail running was my thing and less sore on my old skiing injured knee. Due to the distance the Canix races are away and my hate of driving I haven’t raced that much but soon discovered you were allowed to run with dogs at parkrun (http://www.parkrun.org.uk/) and this suited me as there are 2 park runs within a half hour drive of home and more just a bit further. Lots of runners with dogs to meet There and friendly no dog runners, you register once for free and can turn up every Saturday 9.30am Scotland, 9am rest of UK at loads of different parks for a times 5k run or race if you are competativly minded. They email/text you your time and you can go on line and see all the results and all the statistics if you like that sort of stuff which I do. I am now back in to my agility with the dogs and this is my main sport but as much as I can we are out running together and with friends and I will race as much as possible in a busy sporting calendar as long as I don’t have to drive to far to get there! Recently after talking and thinking about it for 4 years a few of us have decided to run our own races in Scotland. My best canicross weekend was the Mugdock park weekend last September which combined all my favourite things camping , canicross, dogs, socialising (think it was cider that weekend) and Mugdock park where I have been walking since before it was a park and I was about 6 years old! Crufts 2011 was also great as well as I ran Finn our wee rescue collie and he is a star. Jura – Show border collie who prefers agility and running so isn’t a show dog any more. She’s Fraser’s dog for agility and he ran her at the Mugdock race and won both days! Tiree – Juras full sister, loves to sprint and gets very excited at the start of races which can be a bit embarrassing, also the cause of my knee injury on the 31st of Dec 2011 as she made me set off way to fast in her excitement and something had to give! Finn – Rescue collie from Ireland, the best wee running buddy anyone could want for, he could run all day and still want to play when you let him off at the end. Much steadier than Tiree but still pulls out, easy to steer, his ears go back when a turn is coming up listening for an instruction. I run 2 together at park run or in Canix races – 3 is too strong for me but you learn from your mistakes! If kids are running Fraser runs Jura and Scott runs Tiree as they are as fast as each other. I do pet sitting as a side line business (http://www.connalmac.com/ConnalMutts.html) and often canicross with client dogs who are boarding with me, sometimes up the forest with 2 in harness and the rest free running, they all enjoy this and are tired afterwards which make it easier to look after them. One client dog, Oliver, has raced with us as well. A few years ago I was up the moors at the back of Dunkeld with Callie trying out our new off-road trailer with the mountain bike. The trailer jack-knifed and destroyed the rear mech on the bike, so I ended up with no gears. We were six mile in and as I was attempting to scoot out Callie decided we were going too slow and decided to go for it. Fortunately she was in a bog standard harness and pulled us out the full six miles at approx 15 mph through some very rough single track. Callie can’t get off the lead so I had already been training her on turns and commands for speeding up and slowing down. I decided to look up the net to see if anyone else uses a dog to work with the bike. To my surprise I came across bikejoring and was so surprised to see pointers are very popular in the sport. I then decided to get into racing and found out about The Sled Dog Assoc. of Scotland (SDAS), so decided to go to a rally after getting excellent advice from Charlie Brecknel at SDAS. We came in 3rd in our first race and hooked up with loads of other people. We now race with SDAS in the winter season on the rig where we now have Isla as well. In the summer we go on 2 to 4 day trips in the Cairngorms bikjoring, coverying on average 25 miles per day. 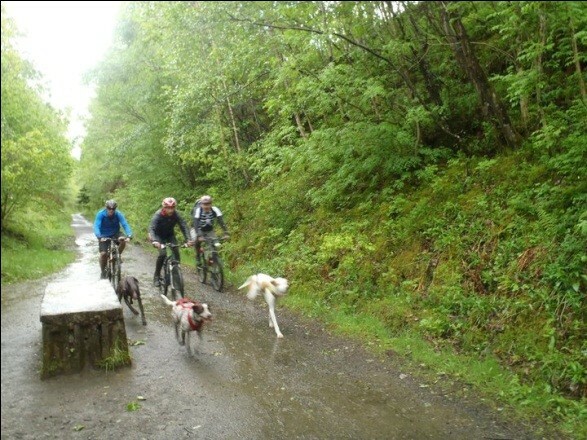 And also train at Devilla Forest, The Seven Stains mountain bike trails, Blair Athol, Loch Ordie to name but a few. We now have everything from the mountain bike, to scooter to the rig and snow sled. We are currently sitting 1st in our 2 dog open category with SDAS, although we don’t have much competition at the moment. We also use both h back and x back harnesses of which the dogs work very well with. We also run gang lines from staggered to double and also single. We have gained so much from racing by getting lots of advice from proper feeds, racing suppliments, hydration, advice on gang lines, paw wax, dog boots etc. And still got lots more to learn. Mushing is not a straight forward sport and there is so much to learn from the welfare of the dogs to proper training techniques etc. We are totally hooked in the sport and always willing to help others get into the sport. What Way? I Can’t Hear You! 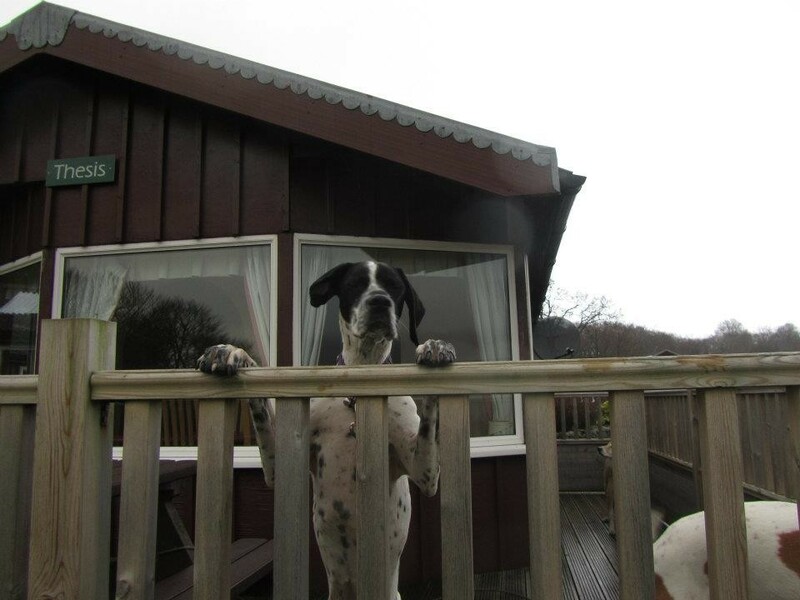 About a year ago a small English Pointer puppy was given to the Inverness branch of the SSPCA as her breeder wanted her put to sleep, due to her being born deaf and therefore “untrainable”. Thankfully the vet said no and she was rehomed to the SSPCA and then she went to stay with Team Rigby in Kilmarnock. She has settled in, after demolishing our house and is now starting her career in the world of Cani-cross, Bike-jor and will be introduced to Mushing when she’s a bit bigger. For those of you who have met Pixie you will know her as a very excitable wee dog, who loves to run. She can regularly be heard howling at the start line or at the rear of a running group as she’s desperate to get in front of everyone! She’ll even go and fetch her own harness, when she wants to go out. The only time she won’t run is when it’s freezing cold or there are hailstones, but I’m happy about that! For the breeder who said she was untrainable, she has been no harder to train than our other dogs. We have simply had to adapt the way we train her. We started by taking her out very short distances with Logan running in a two dog team. She learnt very quickly from him what she was meant to do and she now pulls like a wee steam train. If we’re approaching a junction, she will look to him, to see what way he is moving and if she’s not running with Logan she responds well to different tugging patterns on the bungee line. So far she has come third with Logan and I in a Canix race and helped myself and other’s achieve P.B.’s at Strathclyde Park Run. With a few folk now queing up to have her help them! So the moral of this wee story, is never give up too quickly on a dog with a “disability” just because it might be a bit of hard work, you never know, you may have a star in the making too! This time last year, Ali and I had never even heard of bikejor, never mind tried it. 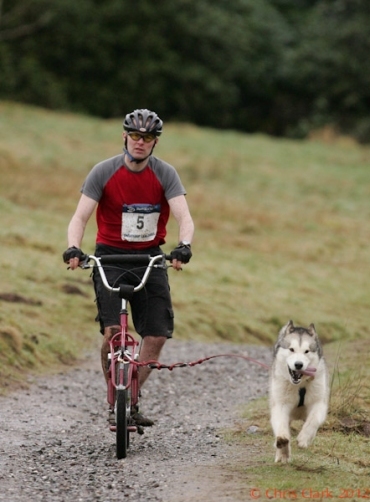 It wasn’t until an e-mail was circulated at my work looking for people interested in canicross and bikejor that we decided to find out more about it. I was kindly put in contact with Stewart Rigby and Alan Morton and met up with them on 30th May 2011 just outside Callander. Ali and I turned up with our bikes (no dogs), with a view to finding out what bikejor was all about. Alan had his dogs Callie and Isla with him and we watched intently as he harnessed the dogs and attached them using a line to the head stem of his bike, with both dogs getting more excited by the minute. I don’t mind admitting when Alan set off with Callie and Isla and Stewart set off with Logan, my legs were going hell for leather trying to keep up and I was more than a little nervous when Alan offered to lend me one of his dogs “to have a go”. It was quite exhilarating and after that first time I was hooked! In May 2011, we had 2 pups Suki (sibe x GSD) and Storm (siberian husky), they were 8mths and 5 mths respectively so too young to bikejor. Ali and I spent the next few month teaching our 2 pups the commands “Gee”, “Haw” and “on by” whilst we were out walking with them and got them used to being in harness. After taking some advice on what we needed we ordered their first harnesses from Trailbaby https://www.facebook.com/#!/trailbabysleddog.k9gear?sk=info . As they got a little older we started to walk/jog with them and so came the commands “Hike on”, “steady” and “woah”. Then in September 2011 came a new addition to our pack Tamaska, all the way from Celtic Animal Life Line near Dublin www.celticanimallifeline.com . We had been told he had been in kennels for about 9 mths but was running about 5 miles most days next to a bike, so decided to give bikejoring a go with him. 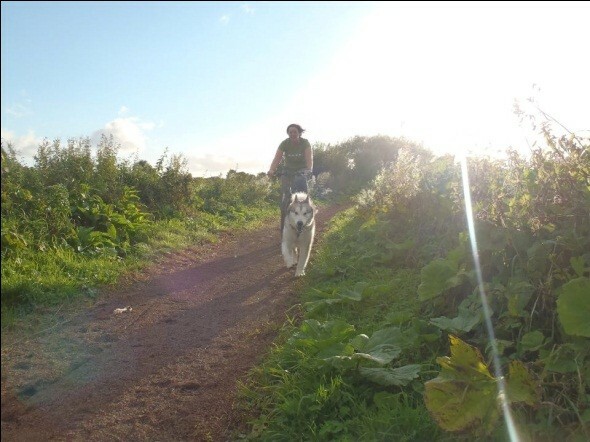 Soon after Tamaska (Tam) arrived we got his harness ordered and on 10th September 2011 we took him out bikejoring for the first time. I’m not sure who enjoyed it most me or Tam and he took to it like a duck to water. We, Ali, I and the dogs are all still learning and Storm and I took part in our first event at Mugdock in February and had a fantastic time. We may have come last but we certainly had fun! For me it is all the about the dogs getting good exercise, having fun and learning from others with more experience. 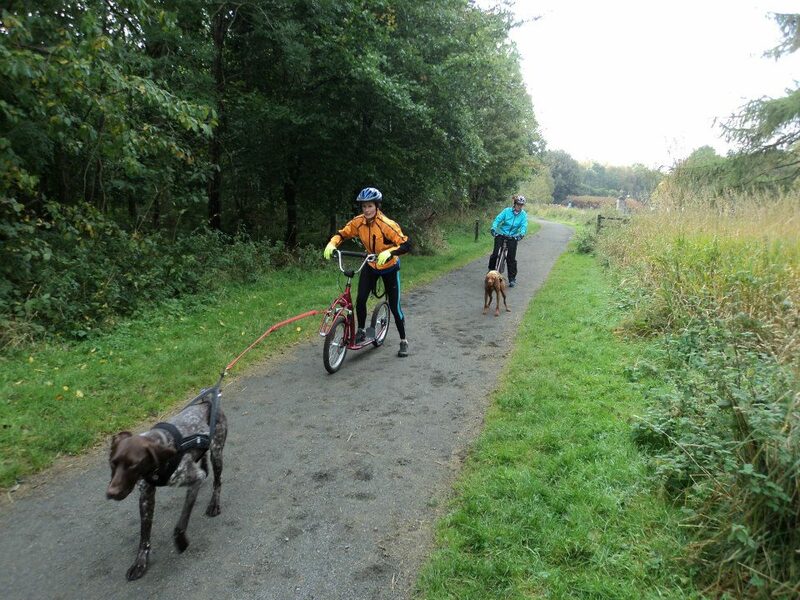 We are also trying a bit of scootering and canicross which the dogs love equally as well as bikejor, now I just to need to get myself as fit as they are! For energetic dogs that can’t get off lead, I can’t think of any better way to exercise them. The dogs love it! All you need to get started is a bike (with working brakes), a cycle helmet and a bungee line to attach the bike and dog. For the dog a properly fitting harness is essential along with lots of praise and encouragement. Got all that, NOW you’re ready to go and have fun! After starting our rescue malamute Tamaska with bikejoring, which he took to like a duck to water, we decided to invest in a scooter for a bit of variation in his and our exercise. I found the scooters initially looked the same, however soon found that they were quite different. Did we want no suspension, front suspension, full suspension? Then there was the brakes did we want v-brakes, disc brakes (hydraulic or cable)? Good grief, why is there always so much choice. 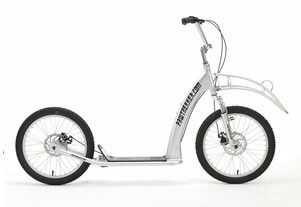 Then of course the price ranges from around £215 up to about £430 for new ones depending on the brand and specification. So lots to consider. 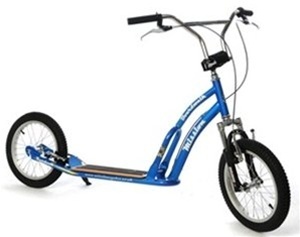 After some consideration we eventually chose the Pawtrekker which has quick release brushbow, quick release wheels and disc brakes on both wheels. It also has high ground clearance which reduces the impact of grounding on rough terrain. Since buying our Pawtrekker I have seen several different scooters advertised and sold on Mushers Exchange on FB, so always worth a look if you want a wee bargain, although they do seem to hold their price well. – A properly fitted harness for your dog(s) – we use a cross back when using the scooter but depending on where the bungee line is attached to the scooter a short running type harness could also be used. We started using the scooter with Tamaska, who loves it, he gets excited at the mere sight of the scooter but since then we have also tried it with our 2 siberian huskies Suki and Storm on a double line, they loved it too. We started off on flat trails in our area just to get the dogs used to it, then moved on to rougher more challenging tracks, sometimes we get off and either run next to the scooter to help the dog on the hills and other times we just scoot a little to help out. (it’s certainly one way to tone the bum and thighs). I would point out that it may be worth speaking to local track/woodland owners to ensure they are happy for you to use your scooter in the area. I know some areas do require you to have a permit for use of the scooter. Most of all be responsible when on trails as there will always be other trail users around. Tamaska took part in his first scooter race at Mugdock earlier this year and to say he got himself a little excited at the thought of racing would be an understatement. Unfortunately we haven’t done much with the scooter since then as the temperatures have been a little warm for our breed of dogs to be exerting so much effort so we have been concentrating more on canicross. We are however looking forward to the cooler weather so we can get them back out on the trails with the scooter. 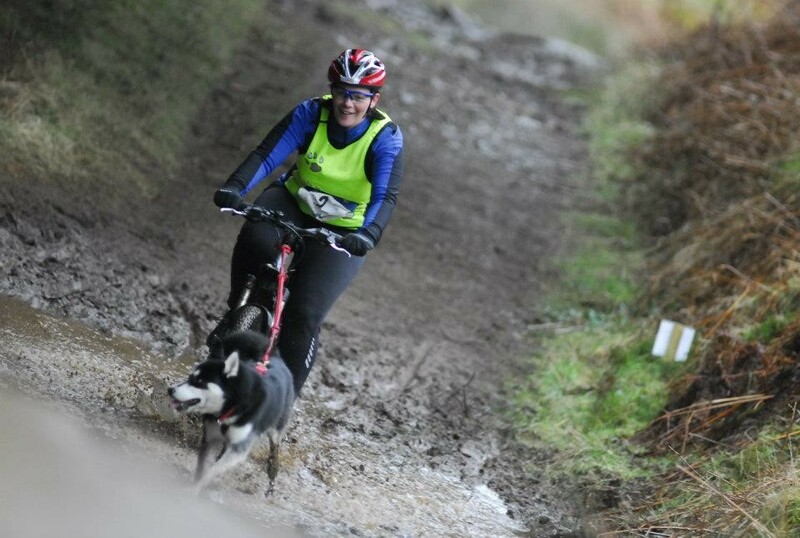 Although we take part in canicross, bikejor and scooter activities we are certainly not experts and are always happy to take advice and learn from others with more experience. However, from our experience we found that starting with a dog that pulls like a train is considerably easier with the scooter as you just step on, whereas with the bike you have to think about getting your feet on the pedal and your bum on the seat. We have found that the scooter is a fabulous way to exercise the dogs and ours certainly seem very happy doing it. Happy dogs = happy owners.